U.S. 67 enters Iowa from Rock Island, Illinois across the Mississippi River on the Centennial Bridge. The route overlaps with U.S. 61 Business in Downtown Davenport before heading east to the Bettendorf Riverfront along River Drive. The US highway mirrors the Mississippi northeast from the Quad Cities as a Great River Road to Le Claire, Princeton, Camanche, Clinton and a rural end at U.S. 52 and Iowa 64 near Sabula. 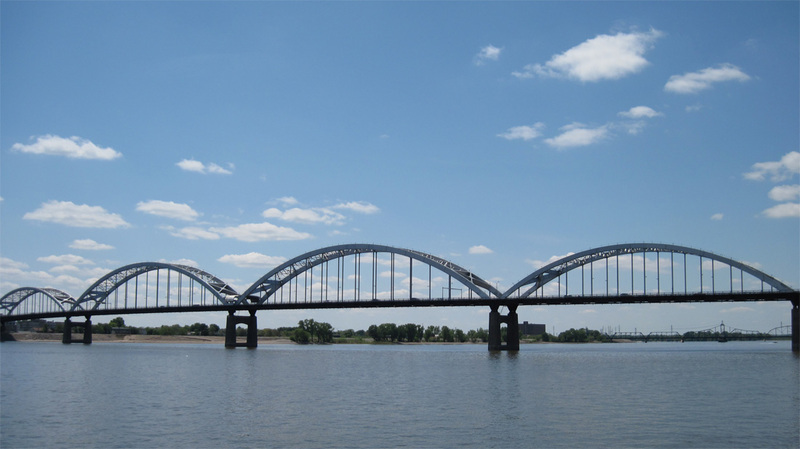 The Centennial Bridge spans the Mississippi River in this view southwest from LeClaire Park on the Davenport Riverfront. Photo taken May 9, 2010. 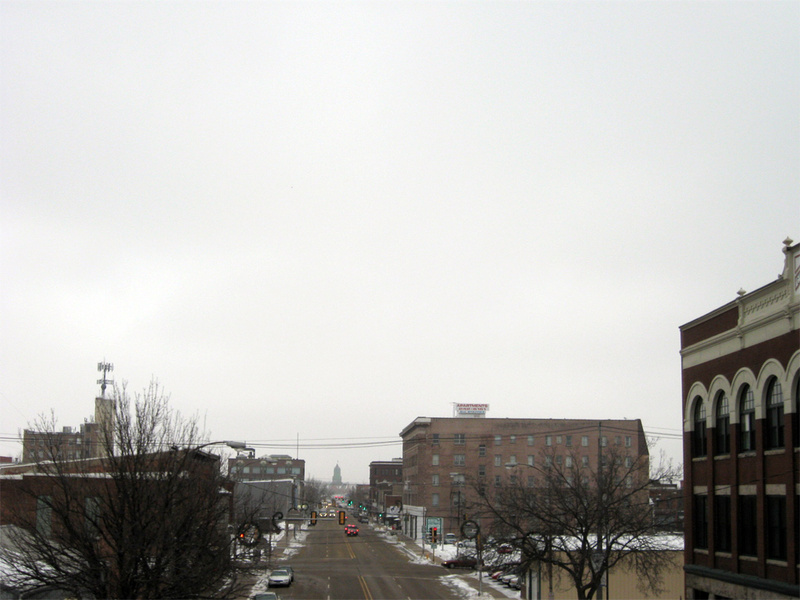 The view north from the Gateway Bridge at the intersection of 2nd Street and 7th Avenue in Downtown Clinton. U.S. 67 turns from 7th Avenue South to the left onto South 2nd Street straight ahead as part of its alignment through the city. Photo taken December 21, 2009. 13th Street stems south from the half diamond interchange (Exit 4) of Interstate 74 & U.S. 6 east at Kimberly Road to carry motorists from the freeway to U.S. 67. This stretch was expanded during construction of the new I-74 Mississippi River bridge. The house at Mississippi Boulevard was subsequently demolished. Photo taken 05/07/10. Approaching the one-way street couplet of U.S. 67 west of downtown Bettendorf on 13th Street south. 13th Street was realigned further west during work for the new I-74 Mississippi River bridge. The business on the right was razed by 2013 to make way for the new roadway. Photo taken 05/08/10. Grant Street carries U.S. 67 south from 26th Street through Downtown Bettendorf to River Drive ahead of 6th Street in Davenport. This intersection was relocated westward by 2016 during work to expand Grant Street to two-way traffic. The car wash on Grant Street was razed. Photo taken 05/08/10. Approaching U.S. 67 (Grant Street) on the relocated section of 13th Street south in Bettendorf. Photo taken 03/12/17. 13th Street previously ended at State Street (U.S. 67 north) by the ramp to the Iowa-Illinois Memorial Bridge into Moline. State Street is now discontinuous due to construction of the new bridge. Photo taken 05/28/11. 12th Street south at State Street (former U.S. 67 north) by the Bettendorf Riverfront. The adjacent ramp to I-74 will remain in service until the new Mississippi River bridge opens. Photo taken 03/12/17. A pair of reassurance markers for U.S. 67 appear along State Street east of 19th Street by the Waterfront Convention Center. Photo taken 03/12/17. Valley Drive north from Riverdale through Panorama Park and Pleasant Valley represents the pre-1959 alignment of U.S. 67 east to LeClaire. The two-lane road was designated as Iowa 417 between 1960 and 1968.2 Pictured here is the crossing of Spencer Creek. Photo taken 05/28/18. Valley Drive intersects the south end of County Road Z30 (Wells Ferry Road) at Pleasant Valley. Photo taken 05/28/18. County Road Z30 travels 12 miles north from Valley Drive to the rural city of McCausland. Photo taken 05/28/18. Valley Drive proceeds east from CR Z30 and Pleasant Valley to enter the LeClaire city limits at SW 35th Street. Photo taken 05/28/18. Valley Drive lowers in elevation to end at U.S. 67 west of Sycamore Drive and Interstate 80. Photo taken 05/28/18. Eagle Ridge Road north at U.S. 67 (Cody Road) in LeClaire. A unique sign references the distance between the traffic light and the parallel Dakota, Minnesota & Eastern (DME) Railroad Corporation line. Photo taken 05/28/18. Iowa Highways: 400 to 419 (Jason Hancock).